It’s not too hard to learn about things that begin with h. Here’s a handy dandy letter h worksheet that can help you along with that. 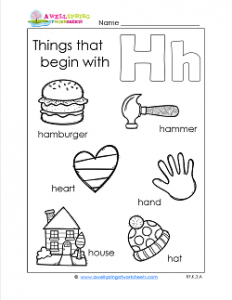 This page has the words hand, house, hat, heart, hamburger, and hammer. Use this worksheet in center times where kids can get some individual help with letter h, whole group, or as a substantial time filler for letter of the week. Have kids identify the objects, practice saying the letter h (and, if you want, it’s sound), circle each h, and color. Please go to this page to see all the things that begin with a-z worksheets.